Whether you’re an interior designer or just a lover of design, there’s often a certain piece in a space that becomes your favorite. It could be something you bought on a special trip, a piece of art, an eBay score or maybe a family heirloom. They are the pieces you never tire of. This series is about those pieces and why we love them so much. MY FAVORITE PIECE: A vintage lamp found at Pepe’s Thrifty Shop in Culver City, CA is my favorite piece in my living room. It was a diamond in the rough, it didn’t have a shade, it was dirty and dusty and hiding in a corner. When I picked it up, it was heavy and I could tell it was really well made, possibly valuable and definitely worth the $50 price tag. I’m sure to other people this lamp looked like nothing or a piece of junk, but I was really drawn to the classical shape and lines of the base. Even though my personal style is more modern, I bought it thinking I could use it for a client. Sometimes I buy things and hold onto them thinking they may work for a future project. But if I really love a piece, I’ll just keep it for myself even if I don’t have an immediate use for it. Needless to say, I have a growing closet of amazing and original accessories that I can’t wait to find homes for. THE ROOM: What I love about my living room is that it looks pulled together and at the same time it’s inviting. It’s comfortable for hanging out and talking and the lighting is really pretty, especially at night with a fire. Guests are welcome to put their feet up on the table and relax. The house has an open plan and lots of spaces that are kid-friendly. But the kids know that this room isn’t for playing – it’s probably the one room in the house that is reserved for adults. COLOR PALETTE: I wanted a soothing color palette with lots of soft colors for our home. The walls are Benjamin Moore Edgecomb Gray and the ceiling beams are Benjamin Moore Coventry Gray. They are slight variations of the same color family which creates a tonal feel. I like little punches of color, but even the pops of color I chose are still quite subtle. When we moved in, the fireplace had original 1920’s tile which I generally love but the colors were mustard yellow, green and a burgundy red and it was not what I envisioned for this space. 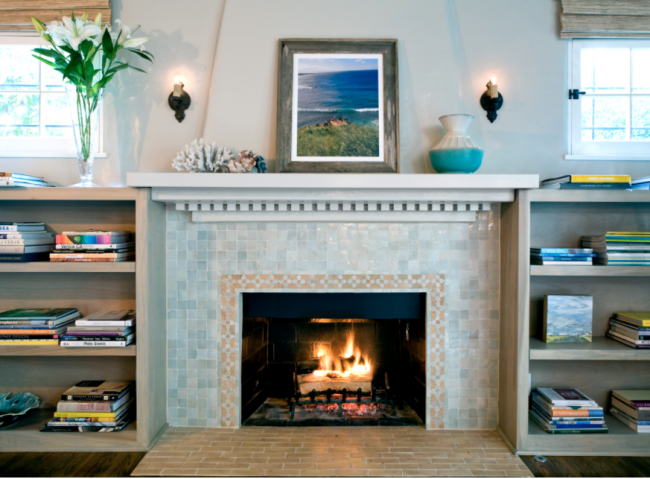 We added the bookshelves and re-finished the fireplace with Moroccan tiles from Ann Sacks. I love the soft contrast of color that compliments the paint colors and adds to the relaxing feeling. I sit alone in this room a lot. The morning light is just amazing. 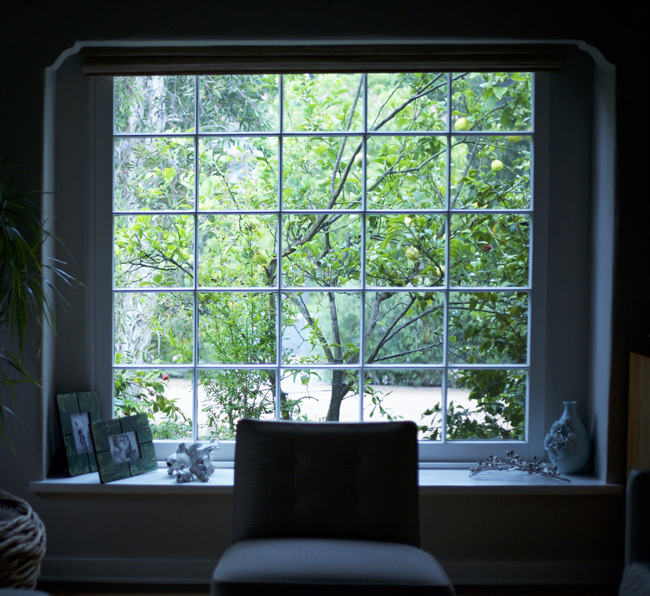 I’m an early riser and I love to sit with a cup of coffee when the whole house is still asleep and stare out the window at the lemon tree. PUTTING IT TOGETHER: I already had the bar and the art but the space felt dark and I wanted something big to make a statement and add brightness. 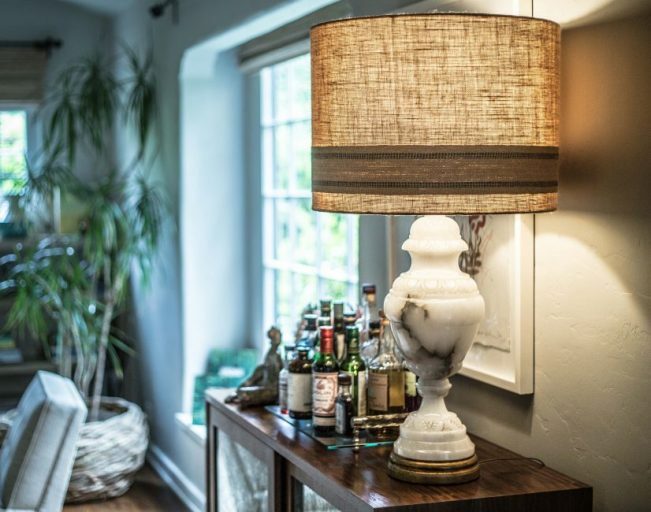 I brought the lamp in, and added the shade from Cindy Ciskowski, a local bespoke lamp shade designer. The over-sized linen shade and clean lines of its drum shape create a new statement when juxtaposed with the ornate base. 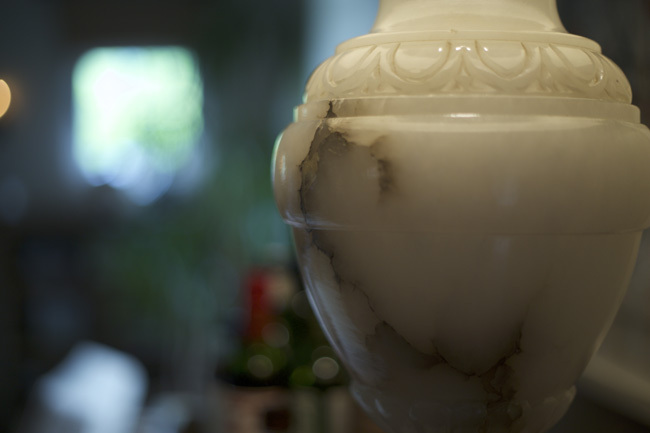 ACCESORIES: There is a lot of stuff surrounding the lamp, but it all has balance. If the liquor bottles were just on the table it might feel cluttered, but the tray creates order. Also, I love clusters of three so the three pieces on the left become its own little group. 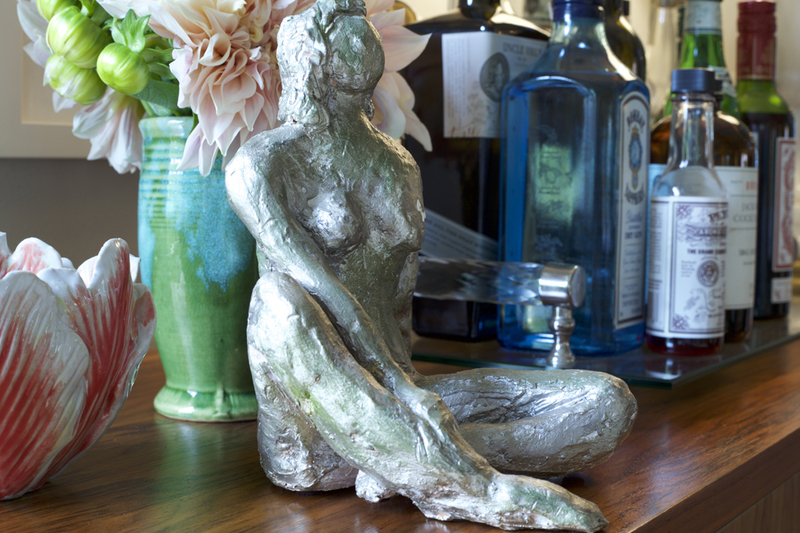 The little silver sculpture is quirky, but I love it. It cost around $10 from Olde Good Things. I imagine it was made by a student in a sculpture class because I can still see the clay coming through the paint. I got the little green vase at a flea market in New York and the pink bowl is from Anthropologie. Layering accessories is one of the hardest, and most effective design techniques. Sometimes people think you can’t put anything in front of art but I think it adds dimension and makes a room feel lived in and warm. 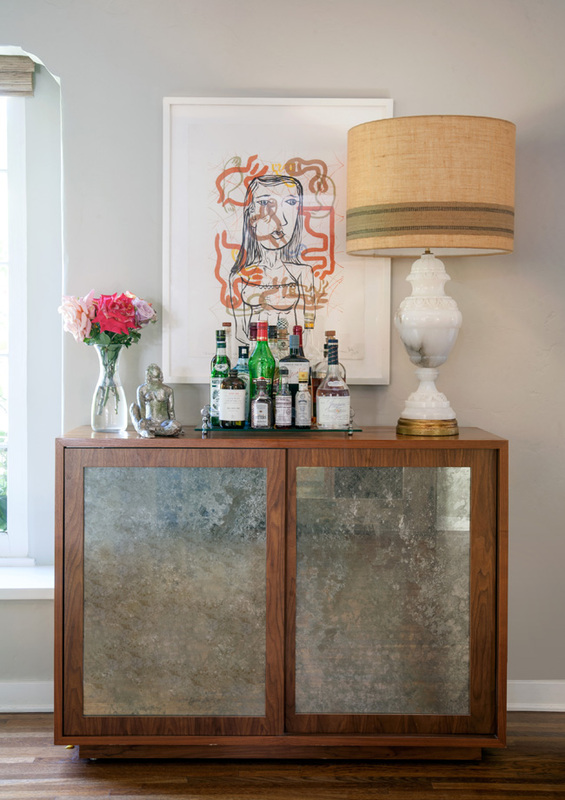 There’s a sense that it evolved over time and it’s the combination of the more mass-produced things and the unique, collected pieces with a story or a history that really makes a rooms or home special.